Jordan Peterson world famous psychologist, thinker and Kermit the frog impersonator (you’ll understand that one if you’ve ever heard him speak) is coming to town this week. Most famous for his book 12 Rules For Life: An Antidote To Chaos, Professor Peterson from the University of Toronto has used his years of clinical practice, insight into religious and cultural narratives, and grumpy granddad wisdom ("clean up your room!") to attempt to provide a North Star for those drowning in the sea of modern relativism. He’s had some success with thousands of people claiming he has helped them get their lives on track. The Left, true to form, in getting everything fantastically, spectacularly wrong, absolutely hate him. 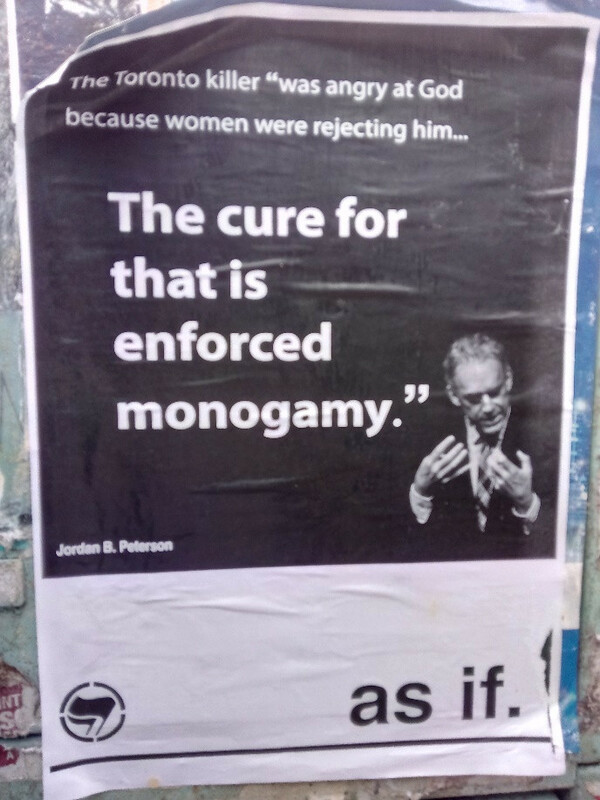 The local chapter of "Antifa" have put up these posters with his quotes. At first blush they may make him seem like some incel loon sticking needles in Barbie dolls in his basement. But context, as the man who sat down on a beer bottle and had to visit A&E said, is everything. The first quote comes from a long interview Dr Peterson did on the little known PKA podcast. Speculating as to why so many feminist critics take it easy on Islam while attacking the western ‘patriarchy’ with vigour, he exasperatedly suggested a Freudian motivation. It may be wrong (attributing Freudian motives to behaviour is always a hopeless endeavour as it is in the end unfalsifiable), but it is as good as any explanation until such feminists provide an alternative accounting of their intentions. The quote above it is not Peterson’s, but a soft pedalling of what these feminists actually do – they don’t just ‘tolerate’ it they are completely and unforgivably silent on the egregious treatment of women not just in Saudi Arabia but across the Muslim world. In the modern world, analyses of cross-national data reveal positive statistical relationships between the strength of normative monogamy with both democratic rights and civil liberties. That Peterson should have got such flak for supporting the cultural norm of much of the Western world suggests just how loath many progressives are to acknowledge the foundations of our strength as a civilization if they don’t chime with their ideology. It may seem a pointless task, employing internet forensics to find the context of these quotes, when "Antifa" only wish to distort and lie about the good doctor. However, I’ve gone to the trouble because this week the compliant ever leftward leaning mainstream media will no doubt repeat them. Expect to hear him also described as a "darling of the Alt-Right" (which just means he is liked by young men on the internet) and as a hard line conservative (he actually identifies politically as a classical liberal). Peterson has committed two cardinal sins of our age: openly challenging cultural Marxism and defending masculinity. He first came to prominence when he refused to comply with speech codes at his University forcing him to use made up gender pronouns. He has since railed against the persistent radical Marxist brainwashing which higher education colludes in. Anyone who works in education, such as myself, knows he speaks the truth. What further annoys the Left is his popularity with men, particularly younger men. Peterson has found a huge audience among both genders, but his message of personal responsibility, discipline and the need to ‘stand up straight with your shoulders back (one of his 12 rules) has appealed most to young men. He has a no nonsense, authoritative style which no doubt sees him acting psychologically in loco parentis for some of these men with absent fathers. Why such a positive, beneficial, much needed message delivered by such an obviously decent man has attracted such bile is mystifying. Or is it? Perhaps Peterson is right in his Freudian explanations, his Lefty critics just being unable to handle a strong male voice, his style a little too reminiscent of the father they both love and hate. Or they may resent that his popularity disproves a perpetual lie of the left, that boys don’t need fathers. Either way, they’ve just got daddy issues. And they should bloody well get over them.